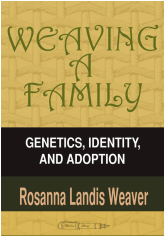 Rosanna Landis Weaver explores the latest research on genetics and personality from the perspective of her own experience as an adoptive mother. In Weaving a Family: Genetics, Identity and Adoption, she ponders both science and parenting from a place of love and curiosity. Both families linked by biology and those that include non-genetically related children will appreciate the fascinating questions of nature and nurture.